Navigation: Home » Investing » The Yield Curve Inverted on 12/03/18 – What Does It Mean? On December 3, 2018 the US 3 Year Treasury yielded 2.84% annually. Wildly, the 5 Year Treasury yielded 2.83% – that is, the yield incentivized investors to take on 3 year securities instead of 5 years! This rare condition – where a Treasury note of shorter duration pays more interest than a longer note – is known as a yield curve inversion. In typical markets, those willing to take on longer duration investments are rewarded for their patience with higher yields. The 3s5s inversion was joined on 12/04 by the 2 year note also trading above the 5 year. This condition was last seen beginning in Spring 2007 roughly 9 months before the Great Recession began. The most common way to visualize the yield curve is by interest paid on securities of increasing duration. 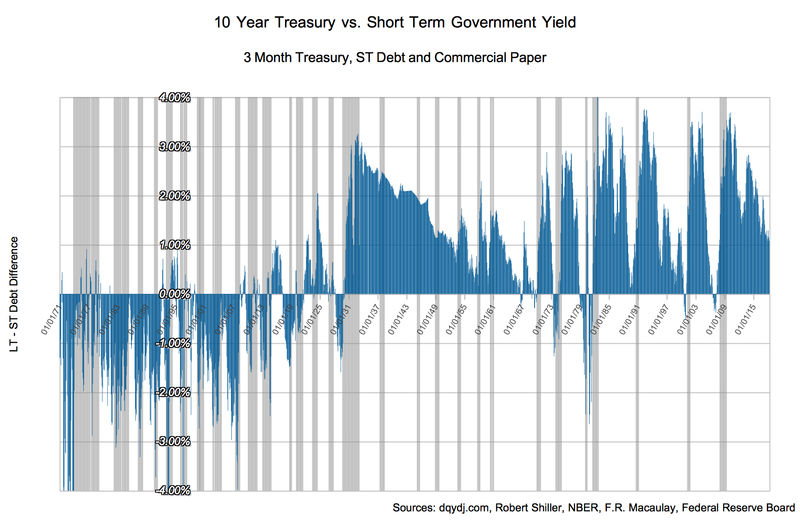 From the US Department of the Treasury you can grab daily resolution yield data for securities of increasing duration from 1 month to 30 years. 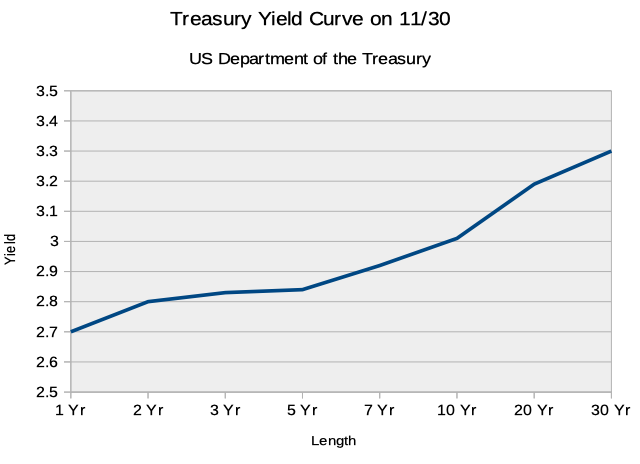 On November 30, the yield curve was properly oriented. Although yields were relatively flat each increase in maturity paid an increasing interest rate. 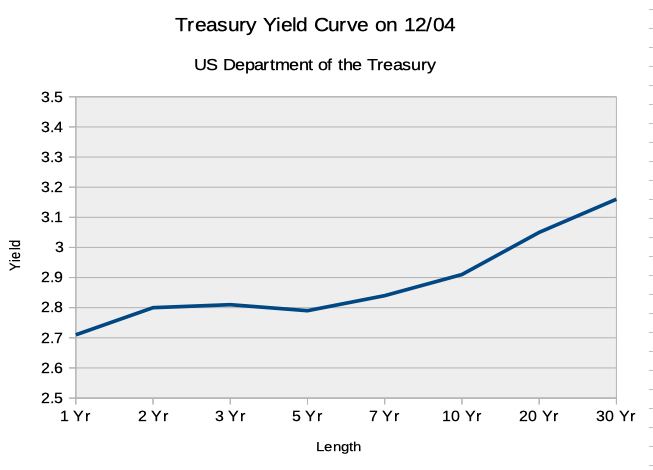 Whatever the impetus – doubt in the tariff announcement, anticipation of the day of mourning for former President George HW Bush, or something else – 12/04 marked the second day of an inverted yield curve. What Does the Inversion Mean for the Economy? First, note that yield curve is a leading indicator. Yield curve inversions during modern times (read: since the Recession of 1969–70) precede recessions by between 3 and 15 months. Using the 2 year 10 year difference (2s10s), the indicator was 100% reliable… for the last 7 recessions. Before that, it hadn’t worked since the Great Depression – there was a span of 6 recessions lacking an inversion. You can see more information in our visualizations of yield curve inversions article. Classically, the current conditions might be telegraphing poor conditions between 2 and 5 years out. How Should You Interpret the Yield Curve Inversion? There are probably three ways you can interpret the inversion. How you weigh the possibilities will affect your own positioning on the economy – and with your investments. And it should be noted: previous recessions caused drops in US equity markets. Let’s look at all three arguments, shall we? The key to this argument is that a yield curve inversion preceded the last 7 recessions by anywhere between 3-15 months. If you agree with this interpretation you should examine your asset allocation. The proper psychology of setting up your portfolio would then be: what asset allocation would I not mind during a recession? The yield curve is not a perfect recession indication. As you can see in the long run graph, it didn’t work for 2 whole generations starting during the Great Depression. If you believe this time is different, a useful line in the sand is late 1913 after the foundation of the Federal Reserve. The yield curve inverting was reliable before the Great Depression but not again until the 1970s. If you think the Great Recession likewise broke the inverted curve as an indicator, I’d love to hear your take. It’s also possible that the inversion is a fluke. Especially as more and more trading is done by computers, it’s possible some conditions triggered the odd yields from the 2s and 3s vs. the 5s. Some sort of algorithmic fluke or constraint might also explain why, for example, Canada’s yield curve is also flattening. Some possible flukey things? Maybe a supply issue between 2s, 3s, and 5s – forced buying in the 5s may have driven yields lower. It’s a stretch (and mostly dissolves if other countries are also affected such as Canada and Japan). Personally, I’m nervous and treating the inversion as real. I’m on record here as being somewhat jumpy for… well, the last 5 years (ha). For two married thirty-somethings with a couple young children, that’s meant targeting between a 65%:35% and 75%:25% risky-to-safe asset ratio with our investable assets. Currently we’re sitting on the riskier side of that range. You never know the exact timing of a market fall but we’ll probably take it down closer to 60%:40%. Always interested in your thoughts – how do you handicap the possibilities? Is the yield curve inversion a real indication of an upcoming recession? Does it not portend anything since this time is different? Or is the inversion just a fluke, possibly due to algorithmic trading? So if you go 60-40 now what signal will you use to go back the other way? My problem with taking money off the table is figuring when to go back in. Sometimes the recovery is very quick, sometimes the fall is a two or three ledge event. I’ve been ok at figuring an exit strategy, not so good about when to re-enter. Ha I hear you – and my old answer would have been 100% mechanical/valuation based. Roughly, wouldn’t try to capture the exact bottom anymore so there would be some element of an already improved market (and losing some upside). I’ll put together a post at some point. And the answer isn’t when the curve uninverts, that tends to happen well before a recession ends (or even before recessions begin). With the inversion of the 2s5s and 3s5s, I’m curious if it could be a result of the way the fed is going about “quantitative tightening.” They stated that up to 30 billion in treasuries per month would roll off the balance sheet as they matured, which would necessarily mean that the short dated assets would tend to roll off the balance sheet first. Combine this with operation twist, and the balance sheet could be heavily skewed toward long dated assets at this point, and it would be getting more skewed long each round of roll offs. It will be something to keep an eye on for sure, but for now, I’m not 100% convinced that this inversion has natural causes. Regardless of the cause though, this will put some turmoil in the financials sector for sure, as the whole basis of their business is built on a normal yield curve. Beyond that I look at the compression in similar terms for Japan, Canada, the UK as additional evidence for “meaning” (possible counter: everything is the US economy nowadays, ha). I’m with you on the open mind, but to handicap my mind-frame it’s definitely more towards “this is concerning”. Enough so I already started changing allocation. I posted another today, interested in your thoughts – 10s3mos are the star of that one in a sense.